The Cook-a-Palooza Experience: Peaches & Cream Smoothie...A Winter Treat! 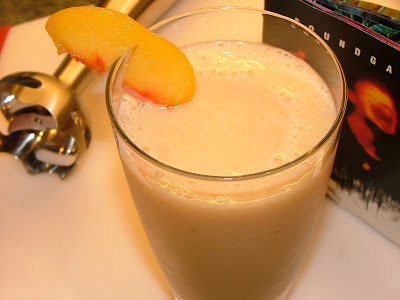 Peaches & Cream Smoothie...A Winter Treat! I love smoothies!!! Many consider smoothies to be a summer beverage but I say why wait until summer when you can begin the year enjoying their delicious healthy goodness! I made a lot of smoothies in my university days when I would typically be running late for the first class of the day. Skipping breakfast was never an option (I can’t function without my morning food) so I would often jump out of bed and make a smoothie while songs such as “Spoonman” or “Rusty Cage” by Soundgarden played in the background to wake my senses. I was a big fan of that band during those years! I still make smoothies when I need a quick nutritious breakfast. For this one you’ll require peaches. Finding fresh peaches this time of year is a bit of a problemo but don’t worry. Just take a stroll down the freezer aisle of your local grocery store and pick up a bag of frozen peach slices instead. The beauty of frozen fruit is it’s always ripe and you don’t have to peel it before adding it to the blender! The frozen peaches also make this smoothie extra thick! You could eat it with a spoon! The other bonus of using frozen fruit is it’ll last longer than the fresh stuff since you can store whatever you don’t use back in the freezer. 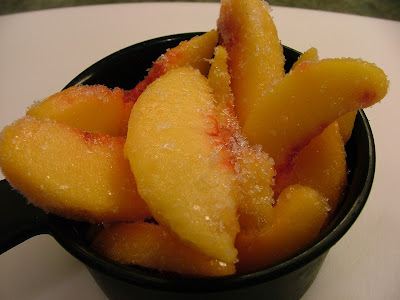 By the way, if peaches aren't your thing, substitute in frozen mango chunks. Equally as good! You can include this healthy smoothie as part of your 2011 “get-fit” resolution or just enjoy it as a nutritious snack or dessert. My only caution to you before consuming this frosty treat is to not drink it too fast or you’ll end up suffering the dreaded brain freeze ….ouch! What's your favorite smoothie combination? All comments are welcome. 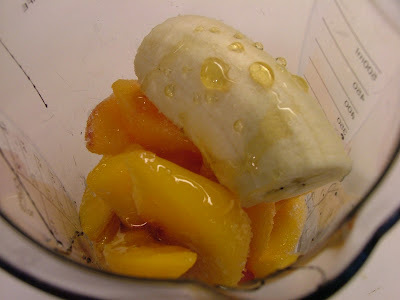 In a blender combine all ingredients and blend until thick and smooth.